In the design of the Bible, Gutenberg wanted to imitate the manuscript as closely as possible. He printed it in two columns, like the original manuscript, and used block printing whereby, owing to very skilled typesetting, he was able to perfect the vertical endings. Gutenberg used a large type, textura, a type with a very closed setting. The name derives from the fact that the vertical strokes of the individual letters ar emphasized resulting in a "woven" appearance. Textura is simply the Latin term for "woven". 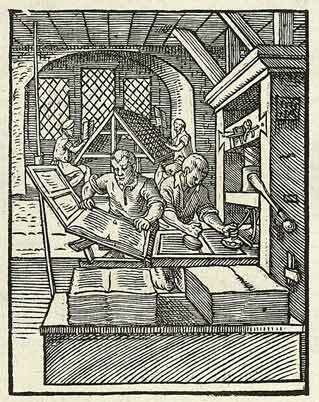 To give you some idea of the world's first great printing enterprise, some figures: The Bible consisted of 1282 pages. Approximately 180 copies were printed, 40 on vellum, 140 on paper. For this, 100 000 types had to be cast. At times, up to twelve printers worked on six presses; besides typesetters, the project also employed assistants responsible for dyeing, inserting the sheets etc. It took three years to print the 180 Bibles - a period in which a copyist would have completed but one Bible.